On January 31, 2017, the Beckman Instruments, Inc. Administration Building (4300 North Harbor Boulevard) was listed on the National Register of Historic Places. Well preserved with few alterations, the building is the best example of Mid-Century Modern architecture applied to a nonresidential structure in Fullerton. Beckman Instruments, Inc. was the first high-tech industrial "campus" to be developed in Fullerton, and one of the earliest in Orange County. Its ultra-modern construction was the precursor to other large manufacturing companies located in Fullerton in the 1950s and 1960s, including the Kimberly-Clark Corporation, Hughes Aircraft Company, and Sylvania Electric Products, Inc. On all accounts, Arnold O. Beckman was a brilliant inventor, entrepreneur, industrialist, and philanthropist. He spent untold hours working at the Harbor Boulevard facility and was an active presence in the city, participating in local business and civic groups and important events. Before relocating to Fullerton, Beckman Instruments (formerly National Technical Laboratories) was scattered at 16 different locations in Pasadena and South Pasadena. While at its new Fullerton location, Beckman Instruments became a unified, cohesive multinational corporation recognized around the world as the top producer of precision instruments for a wide variety of industries. The postwar history of Fullerton is inextricably linked to manufacturing as government officials made the decisive decision to shift from an agricultural to an industrial-based economy. In 1952, the Fullerton City Council adopted an innovative industrial plan, and under the direction of Robert L. Clark, Industrial Coordinator, actively sought to attract new business and industries to the city. Beckman Instruments was the first high-tech and manufacturing firm to relocate to Fullerton, setting the standard for later firms. Beckman Instruments became an integral part of the Fullerton's postwar growth and development, not only providing extensive employment and revenue to the city, but also becoming part of the social, cultural, and geographical landscape of the city. Beckman Instruments, Inc. was one of the most important companies in the history of Fullerton. The administration building at the Harbor Boulevard facility is the last remaining physical reminder of the company's presence in the city. Following World War II, Fullerton remained largely an agricultural community. Revenues from the oil industry had begun to fade around the end of the war, and the city's economy depended heavily on crop production and food canning and preserving, still a multi-million dollar industry. A new era, however, began after the war, and during the national flurry of industrial expansion in the 1950s, Fullerton attracted hundreds of new businesses and industries which gradually replaced agriculture. While all of Orange County was experiencing unparalleled postwar industrial development, Fullerton led the county in manufacturing gains as one industrial giant after another -Beckman Instruments (1953), Kimberly-Clark Corporation (1956), Hughes Aircraft Company (1957) - moved to Fullerton. Realizing that the costs of city services for an expanding population were going to rise faster than tax revenues, the Fullerton City Council adopted an industrial policy designed to move the still largely rural town toward manufacturing and away from the agricultural economy that had existed since the city was founded in 1887. The City Council designated two large areas -one of 500 acres in the southwest part of the city, and another of 200 acres in the northwest section of the city - for industrial purposes. Mayor Tom Eadington hired Robert (Bob) L. Clark (1914-1997) as Industrial Coordinator for Fullerton, the first such position created by a California city. Clark's job, which lasted from 1952 to 1958, was to bring industry into the city. Clark, who would be later honored by the City Council and named Man of the Year by the Fullerton Chamber of Commerce, took his civic responsibilities seriously, and after just two years, the innovative industrial development plan had resulted in 5,000 new jobs. In his first three years alone, Clark brought in more than $30 million in new industries. One of Clark's strategies was to win over large established companies, which would, in turn, attract other businesses that would provide the goods and services needed by the larger firms. Clark's first big catch and the jewel in his crown was Beckman Instruments, Inc. Arnold O. Beckman had selected 40 acres of orange grove in unincorporated land between Fullerton and La Habra, and as competition for the company heated up, Clark extolled the virtues of Fullerton. In an article in the February 20, 1953 issue of the Fullerton New Tribune, Beckman admitted that he selected Fullerton because of its lower tax rate and ample supply of water to conduct his operations. He also thought that Fullerton's residential areas would be a good fit for his present and future employees. An unheard of 8,000 people toured the new Beckman facility during its opening in November 1954, an amazing number of visitors at a time when Fullerton's population was only 13,958. A milestone in the business development of Fullerton, Beckman Instruments' relocation to the city signaled to both government officials and residents alike that Fullerton could attract large successful companies. The massive campus-like facility, with its extensive landscaping and inter-connected buildings, was a new architectural and business model for the city that would be repeated in the 1950s and 1960s. As the city's first high-tech firm, Beckman Instruments showed the promise of what Fullerton could become in a newly industrialized world. The relocation of Beckman Instruments to Fullerton was also a source of pride to local residents, and as Beckman grew in size, stature, and international influence, it became a business hallmark for the city. When the Beckman facility opened in 1954, it employed 900 workers, a combination of relocated employees from Pasadena and South Pasadena, and new ones from the local area. Three of the company's top officials - Joseph L. Fahey (120 Miramonte Drive), vice-president of finance; Earl C. Jason (1211 Luanne), plant manager; and John F. Bishop (1934 Richman Knoll) -would immediately relocate to Fullerton, with more to follow. A multitude of scientific professions, crafts, and skilled workers were required at Beckman, and over the decades, the company would employ thousands of Fullerton residents, many of whom would spend a lengthy portion of their careers or their entire careers at the Harbor Boulevard facility. Fullerton College and Cal State Fullerton graduates would find employment with the company. Former employees and executives would also leave Beckman Instruments to form new companies, such as the International Biotronics Corp. An active group of Beckman retirees still meet in Fullerton. By the time Beckman Instruments had closed its doors in 2010, the company had become an integral part of Fullerton's postwar economic growth and development. The company had provided extensive employment and revenue to Fullerton, but equally significant, it had become a part of the social, cultural, and geographic landscape of the city. Always a good corporate neighbor, Beckman made generous donations to Fullerton groups, including St. Jude Hospital, the Boys Club, the United Fullerton Fund, and the Children's League of Fullerton. Dozens of scholarships were given to local high school and college students; instruments and equipment were donated to Fullerton College and Cal State Fullerton; and funding was provided for science and technology exhibits, programs, and field trips. Arnold O. Beckman encouraged a corporate culture that rewarded and encouraged employees to get involved in the community and nonprofit corporations, and hundreds of Beckman workers volunteered their services to local groups, supporting a wide number of important causes. Beckman remains one of the most important companies in the history of Fullerton. At the time of the nomination, the building was part of new development of industrial buildings that was in the planning stage. A creative scientific genius, Arnold Orville Beckman (1900-2004) would have four distinct careers: research scientist and educator; entrepreneur and businessman; civic leader; and philanthropist. His brilliant inventions, and the companies he founded to commercialize them, represented the beginnings of the American chemical instrument industry. His devices, credited with saving countless lives, transformed medical research and the practice of clinical medicine. Born and raised in the Midwest, Beckman moved to Pasadena in 1926 to study chemistry at the California Institute of Technology. Upon completion of his doctoral degree, Beckman was asked to remain at Caltech as a professor, while also accepting outside consulting work. In 1934, he was approached by a former Illinois classmate, who was working in the citrus industry, for help in measuring the acidity of lemon juice. Working with two students in a metal shed, Beckman developed a pH meter, a revolutionary device that could determine precisely the acidity or alkalinity of virtually any solution. The instrument quickly found a wide range of applications in science, industry, medicine, and other fields. The phH meter or acidimeter was such a huge success that Beckman resigned his position at Caltech and assumed the full-time presidency of National Technical Laboratories. With the advent of World War II, the demand for scientific instrumentation grew, and Beckman saw that there was a great need for new spectroscopic instrumentation. In the 1940s, he invented the first quartz spectrophometer, the commercial infrared spectrophometer, the precision helical potentiometer, the analytical ultracentrifuge, the direct-writing oscillographic recorder, and the automatic amino acid analyzer. These revolutionary products propelled the continued growth of National Technical Laboratories, which was renamed Beckman Instruments, Inc. in 1950. Needing more space, the company started construction of an expansive factory, laboratory, and office complex in Fullerton in 1953. The $2.5 million headquarters and plant were situated on a 40-acre orange grove at a time when Fullerton was just beginning to industrialize, and the company's continued meteoric rise paralleled an economic boom for the still mostly rural city. The new Fullerton plant represented a second phase for both Arnold O. Beckman and Beckman Instruments. The company would grow from scattered locations into a unified, cohesive multinational corporation, and in the next thirty years, would become one of the most recognizable firms in the world. New divisions and departments would be added as the company continued to grow in size and in the range of its devices, while also developing new tests and medical procedures. It was at the Fullerton location that the company made its foray into other countries, constructing its first foreign plant in Germany in 1953, and establishing itself as one of the world's top multinational corporations, eventually serving customers in 120 countries. When Arnold O. Beckman stepped down as president in 1965, at the age of 65, assuming the position of chairman of the board, his company was a world leader in the development and manufacture of precision products for scientific industries, medicine, education, space exploration, and defense, with its products benefitting people all over the world. Beckman's final years were spent as an active philanthropist. Through the Arnold and Mable Beckman Foundation, he was instrumental in establishing the Beckman Institute, Beckman Auditorium, Beckman Laboratory of Behavioral Science, and Beckman Laboratory of Chemical Synthesis at the California Institute of Technology, and also sponsored the creation of the Arnold O. Beckman High School in Irvine. He donated millions to a variety of causes and organizations. He spent his final decades accepting honorary degrees and awards, including the Public Welfare Medal from the National Academy of Sciences and the Life Achievement Award from the Instrument Society of America, and was inducted into the National Inventors Hall of Fame in 1987. In 1989, President George Herbert Walker Bush awarded him the National Medal of Science. In 1960, Beckman and his wife moved from Altadena to Corona del Mar. Beckman would spend untold working hours at the Fullerton facility while also hosting numerous employee ceremonies, parties, and affairs, many of which were held at large local venues, including Plummer Auditorium and the Fox Fullerton Theatre. He was also an active presence in the city, supporting local education, business, and civic causes and organizations. He served on local boards, attended important Fullerton events, and would often accept invitations to speak on the importance of science. He was a member of the lay advisory board of the new Orange State College, now California State University, Fullerton. He would often accept invitations to speak at building dedications, including the dedication of the new Fullerton College Library in 1954, and was the featured speaker at the dedication of a new wing at St. Jude Hospital in 1962. 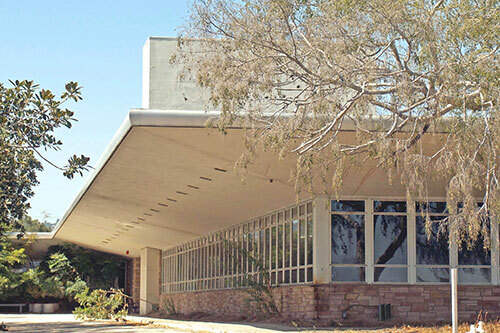 Constructed in 1953/54, the administrative office building of Beckman is an early local example of Mid-Century Modern architecture applied to a non-residential building. Well preserved with few alterations, the building is the best example of this style in Fullerton. The building's distinctive flat roof - with a massive cantilever and angled profile - is the defining element of the structure. While cantilever roofs are routinely seen on Mid-Century Modern architecture, the size (extension) of the building's overhang is exceptional for a commercial building constructed in the 1950s. The flagstone-cladded exterior walls are very evocative of 1950s taste. Its use in a non-residential building is unusual, however, and provides a rough, warm exterior finish to counter and soften the precision and use of cold materials (glass and metal) that are characteristic of the Mid-Century Modern style. The building's strong architectural elements - roof line, repeated window treatments, flagstone veneer - are found on all sides of the building, unifying the exterior look of a large one-story structure that covers over 43,000-square-feet of interior space. Beckman Instruments, Inc. was the first large high-tech industrial "campus" to be developed in Fullerton, and one of the earliest in postwar Orange County. Its ultra-modern construction was the precursor to other large manufacturing companies locating in Fullerton in the 1950s and 1960s, including the Kimberly-Clark Corporation, Hughes Aircraft Company, and Sylvania Electric Products, Inc. The facility's distinctive style and unique building arrangement, developed by notable architect Lawrence Whitney Davidson, set an early standard for the high-tech complexes that were to follow. Before relocating to Fullerton, Beckman Instruments occupied 16 scattered locations throughout Pasadena and South Pasadena, and space had become an issue. With the exception of a few postwar buildings, Beckman's factories, laboratories, and offices were pre-World War II structures that did not provide the flexibility needed for a growing scientific company. The innovative design for the Fullerton facility, which provided expansion space spread out over 220,000-square-feet of buildings, reflected the company's inventive approach to research and manufacturing and signaled the company's move into a more modern era. Interior walls could be easily disassembled and moved to keep pace with expansion; glare-resistant windows provided working comfort for employees; an insulated steel deck ran throughout the factory to facilitate controlled temperatures; and a landscaped open air central walkway allowed visitors to move from the main foyer and administrative offices to individual product departments without passing through new areas. As historian Arnold Thackray noted: "The design was highly modern, centered on the concept of flexibility for further expansion: Additional space could be easily constructed and integrated, and any interior spaces could be reconfigured quickly and efficiently. Such a flexible design befitted a firm dedicated to new instrumentation in a growing array of technologies" (p. 234). In 1955, the national magazine Factory Management & Maintenance honored Beckman with its Significant Plant Award. From 500 plant-of-the year candidates, the magazine chose the new Beckman facility as one of the nation's top ten plants built in 1954. The magazine noted: "Faced with extraordinary requirements for flexibility and expandability, Beckman met both demands to a remarkable degree with a plant that is also a pacesetter in appearance and employee services." In the 1950s and 1960s, the administrative office building became a well-known architectural symbol of the company. Photographs and drawings of the building were used in advertisements, annual reports, and other promotional materials, including Arnold O. Beckman's published speech ("Beckman Instruments, Inc. : There Is No Satisfactory Substitute for Excellence"), delivered before the National Meeting of the Newcomen Society in Los Angeles on November 10, 1975. During the postwar era, hundreds of new industries were established in Fullerton. Most of the plants and factories constructed for these industries were nondescript box-like structures. A few companies used notable architects—Kimberly-Clark employed Skidmore, Owings and Merrill and the American Electronics Plant hired Eugene Choy—but few of the manufacturing buildings of this era reflect remarkable architectural design. Lawrence Whitney Davidson was an excellent choice to design the Beckman Instruments new facility. He had a strong background in both architecture and engineering and had designed other manufacturing plants before the Fullerton project. Over his 30 year career, Davidson moved fluidly from one project to another, designing golf clubhouses, industrial plants, movie studios, school classrooms, and municipal buildings. He shifted easily between private, military, and public works projects. His early work was done in the Mid-Century Modern style, but over time he designed starker, more postmodern structures. Davidson received his Bachelor of Science degree in architecture from the Illinois Institute of Technology in 1935, receiving a one-year scholarship for being high school valedictorian. He served as manager of engineering at the American Can Company from 1948 to 1951, where he patented a new device for stacking magnetizable items (Patent # 2635002A). From 1951 to 1953, Davidson worked as chief architect at the Donald R. Warren Company (930 West Sunset Blvd., Los Angeles), one of the Southwest's leading heavy engineering firms. An influential civil and structural engineer, Donald R. Warren (1897-1973) had joined architects Paul R. Williams and Adrian Wilson to form Allied Engineering, Inc., which worked on the Roosevelt Naval Base on Terminal Island during World War II, and Warren later became known for helping to build large infrastructure projects, including the San Francisco-Oakland Bay Bridge and the Los Angeles International Airport. By the time of the Beckman Instruments project, Warren's company had completed over 200 industrial projects for producers of aircraft, petroleum, cement, paints, instruments, rubber, and metals. After Davidson left the Donald R. Warren Company, Warren would work with other architects, such as Jones and Emmons, on other Fullerton projects, including the Arcadia Metal Products Plant (801 North Acacia) and the American Meter Company plant (300 North Gilbert). In 1952, Davidson designed new container factories in Wilmington and Stockton for the American Can Company. An article in the September issue of Architect and Engineer lauded the Wilmington plant (110 East Sepulveda, razed), noting that it represented "one of the most modern manufacturing plants in the world. " The Wilmington plants' ultra-modern architectural features, especially the large "fin" rising over the center of the building used for an identification sign, were later reflected in the Beckman administration building, which refined the elements of the can plant. In 1954, Davidson established his own architectural firm, L. W. Davidson and Associates, and in February 1956, moved into new headquarters with his affiliate company, North American Industrial Engineers, at 3142 Wilshire Boulevard in Los Angeles. In the 1950s and 1960s, Davidson designed a significant number of impressive and innovative commercial and industrial structures: the S. H. Kress Company Store (1954) in Los Angeles, one of three projects for businessman/art collector Samuel H. Kress; a warehouse and sales office for Coopers, Inc. (1955), manufacturers of men's apparel, in Los Angeles; the Western Gear Corporation (later Westech Gear) Engineering Building (1956) in Lynwood; the Leeden Manufacturing Company plant (1956) in El Monte; a $500,000 modernization and new exterior for the W. I. Hollingworth Building (1958) on West Sixth Street in downtown Los Angeles; the Turco Products headquarters (1959) in Los Angeles; the Georgia-Pacific Corporation distribution warehouse (1961) in Pico Rivera; the National Cash Register Company plant (1967) in Hawthorne; and Statham Instruments in Oxnard (1967). In 1959, Julius Shulman, the great modernist photographer, took shots of the Turco Products, Inc. building, which are on file at the Getty Center. During this same period, Davidson did military work, designing buildings at George Air Force Base, Edwards Air Force Base, and the Marine Corps Electronic School at 29 Palms, while also patenting a hangar for swept-wing aircraft (Patent # 3543461A). He designed film studios, such as the Universal Pictures Studios in Los Angeles and Universal Pictures in Memphis, Tennessee, both in 1955, as well as a pipeline project in the the Arctic Circle. In the 1960s, Davidson began to move into the public building sector, designing the Community Clubhouse at Erwin Park (now Valley Glen Community Park) in Van Nuys, and in the 1970s, began school projects, including a new children's center for Dayton Heights Elementary School, and a $1.32 million project for Bret Harte Junior High School, which called for a new main building, 20 classrooms, administrative unit, and library-media center. By the 1970s, L. W. Davidson and Associates had become one of the largest architectural firms in the San Fernando Valley, which was rapidly developing. In 1979, he was selected to design the $43.9-million dollar Plaza Technical Center (555 Ramirez Street), at the time the largest single construction project ever built by the Los Angeles Department of Public Works. Using a quadrant concept to link four separate structures, the Plaza Technical Center (now the C. Erwin Piper Technical Center) project was the largest single contract ever issued by the local governing body in California. Designed to serve multiple city services, the center also has the world's largest rooftop airport. In addition to Beckman Instruments, Davidson's other major Orange County commission appears to be the Lido Park Medical Center in Newport Beach (1965). Photographs, books, articles, ephemera, and other information on the building are available in the Local History Room of the Fullerton Public Library. American Can Company [Advertisement]. Torrance Herald September 27, 1951, p. 4. On the Internet. Atkins, Ruth. Memo to Jean Miller, "Beckman's Donations to Fullerton Groups." September 17, 1985. "Architects Named for New La Habra-Fullerton Plant." Los Angeles Times July 27, 1952, p. E7. "Beckman, Arnold O." Complete Dictionary of Scientific Biography. Vol. 19. Detroit: Charles Scribner's Sons, 2008: 233-236. Beckman, Arnold O. Beckman Instruments, Inc. : There is No Satisfactory Substitute for Excellence. New York: Newcomen Society in North America, 1976. "Beckman, Arnold O." Current Biography Yearbook 2002. New York: H. W. Wilson Company, 2002: 27-29. 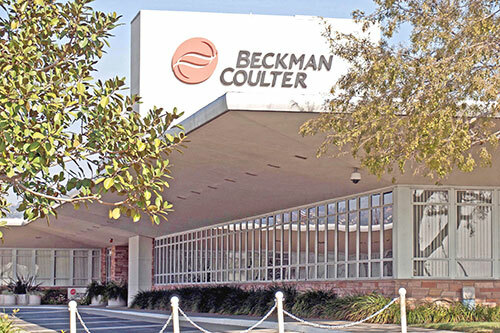 "Beckman Coulter, Inc." International Directory of Company Histories. Ed. Jay P. Pederson. Vol. 22. Detroit: St. James Press, 1998: 74-77. "Beckman Instruments, Inc." International Directory of Company Histories. Ed. Tina Grant. Vol. 14. Detroit: St. James Press, 1996: 52-54. "Beckman Instruments Marks Four Decades of Operation." Los Angeles Times October 12, 1976, p. H5. Berkman, Leslie. "Beckman Forged Empire in Quest of Knowledge." Los Angeles Times December 15, 1974, p. OCA1. 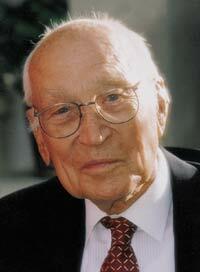 "Chemical Measuring Instrument Launched Beckman in Industry." Fullerton News Tribune Sept. 24, 1957, p. 3B. "Contracts for 2 School Buildings Let By Board." Los Angeles Times January 4, 1976, p. 12. Davidson, Lawrence W. "Device for Stacking Magnetizable Articles." U. S. Patent #2,635,002A, April 14, 1953; "Hangar for Swept-Wing Aircraft." U. S. Patent #3,543,461A, December 1, 1970. "Davidson, Lawrence W." American Architects Directory. 3rd ed. New York: R. R. Bowker Company, 1970: 204. "Dr. Beckman Tells Reasons for Annexation to Fullerton." Fullerton News Tribune Feb. 20, 1953. "Don Warren—Engineer with an Elephant Gun." Southwest Builder and Contractor August 12, 1955, p. 28-29, 32, 62. Fleming, Louis. "Scientist Builds His $65 Million Business on Inventive Genius." Los Angeles Times January 22, 1961, p. J1. "Fullerton Plant Wins Citation." Los Angeles Times October 16, 1955, p. F26. Green, Terence M. "Giant Center Will House 17 Municipal Departments: Project Is Largest Ever Contracted by City Department of Public Works." Los Angeles Times March 11, 1979, p. K1. "Ground Breaking Held for Beckman Plant." Fullerton News Tribune February 1, 1953, p. 1. "Instrument Makers Will Construct Division Plant." Los Angeles Times January 8, 1961, p. P14. "L. W. Davidson & Associates." A Guide to Architect and Engineering Firms of the Cold War Era. By David W. Moore, Jr., Justin B. Edglington, and Emily T. Payne. March 2010. Available on the Internet. "New Container Factory: American Can Company, Wilmington, California." Architect and Engineer September 1952, p. 8-10. ; "New Container Factory: American Can Company, Stockton, California." Architect and Engineer September 1952, p. 11-14. "$1,250,000 Engineering Wing Rising at Plant." Los Angeles Times July 22, 1962, p. M17. Pinsky, Mark I. "Latest Beckman Largess Endows Science Facility." Los Angeles Times November 5, 1985, p. OC1. "Production Now in Full Swing at Beckman Instruments: Move from Pasadena Is Completed." Fullerton News Tribune August 25, 1954, p. 2B. "Rites Set for Builder Donald R. Warren, 75." Los Angeles Times January 18, 1973, p. C3. Schulman, Julius. Turco Products (Los Angeles, California) Photographs. 1959. On file in the Getty Center, Los Angeles. "Scientist Beckman Joins Roster of Great Inventors." Los Angeles Times February 8, 1987, p. OCC1. Sederberg, Arelo. "Former Beckman Executives Launch Independent Company." Los Angeles Times June 19, 1969, p. D14. Smith, Don. "Beckman Prize Is Split By Two Cities." Los Angeles Times August 13, 1981, p. OCA14. Stephens, Harrison. Golden Past, Golden Future: The First Fifty Years of Beckman Instruments, Inc. Claremont, CA: Claremont University Center, 1985. Thackray, Arnold and Minor Myers, Jr. Arnold O. Beckman: One Hundred Years of Excellence. Philadelphia: Chemical Heritage Fountain, 2000. Vartabedian, Ralph. "End of Era for Beckman: A 45-Year History of Greatness." Los Angeles Times March 5, 1982, p. OC2. ________________. "Beckman Quietly Strives for Leadership in Biotechnology." Los Angeles Times November 13, 1981, p. G1.